Create a charming Matryoshka theme party with my Matryoshka (aka- babushka, nesting doll, Russian doll, stacking doll) Party Decorations Printable PDF file. The PDF file includes Streamers, Food Label Signs (blank for handwriting), Cupcake Toppers, and Straw Decorations. 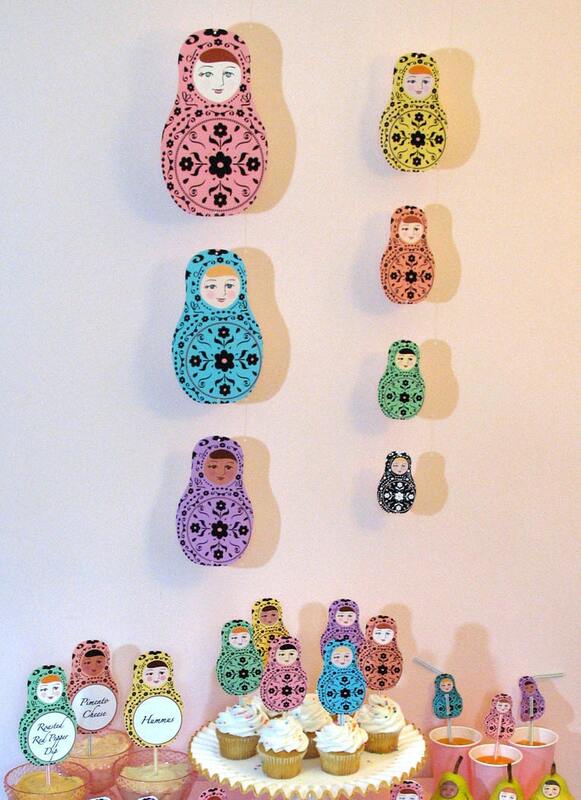 Perfect for a Matryoshka theme birthday party, bridal or baby shower. The PDF file also includes assembly instructions. Just purchase to immediately download the file. Streamers: My Matryoshka party streamer hangs vertically cascading from mother matryoshka to baby. Hang in 2 streams above a party table or as one stream from ceiling to floor. Dolls twirl as party guests pass by! Food Label Signs (blank for handwriting): A feast for the eyes, my adorable matryoshka food signs will add charm to your festive foodscape as they present each delicious delicacy. Cupcake Toppers: My pretty Matryoshka cupcake toppers add a garden of color to your cupcake display. Straw Decorations: My Matryoshka Straw Decorations are festive decorations for your guests drinks.